An ExternalAsciiStringResource is a wrapper around an ASCII string buffer that resides outside V8's heap. 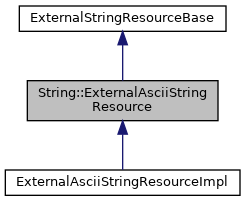 Implement an ExternalAsciiStringResource to manage the life cycle of the underlying buffer. Note that the string data must be immutable and that the data must be strict (7-bit) ASCII, not Latin-1 or UTF-8, which would require special treatment internally in the engine and, in the case of UTF-8, do not allow efficient indexing. Use String::New or convert to 16 bit data for non-ASCII. Definition at line 1761 of file v8.h. Override the destructor to manage the life cycle of the underlying buffer. Definition at line 1768 of file v8.h. Definition at line 1774 of file v8.h. The string data from the underlying buffer. The number of ASCII characters in the string.